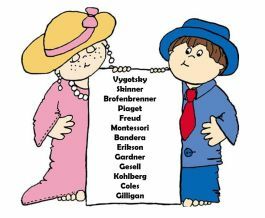 Since child development is based on the theories developed by the expert psychologists and their research, I like to give my students an overview of them. Later on in the year, as I go over specific concepts like intellectual or social development, my students at least have a knowledgeable base of this information from which they can build upon. This interactive lesson has students putting their writing, oral presentation skills and creativity to work right away! As always, you can make this lesson your own by pre-selecting the theorists and resources as well as deciding if this is to be an individual or partner assignment. How will you teach about the theorists? How do we know what works with young children? What prepares us to work with young children? We learn all of this by studying the research done by past and present theorists. Each theorist has made an impact or significant contribution to the field of child development. Today we will begin to learn more about many of them. Randomly have students select a theorist to learn more about. I typically cut apart the names and have students pull them from a basket. My classes have always been such that I have assigned this as an individual project, however, it could easily be completed in small groups. I limit my theorists to those listed in the resource packet, but you can add additional psychologists if so desired. Be sure students are familiar with acrostic poems before project begins. Pass out research packets or link to the school website to save paper. Students will use this resource to write their acrostic poem rough draft according to the criteria in the guide sheet (found below). Teacher checks rough draft to be sure students are using their own words. Depending on class size I will edit for spelling/grammar. If class size is larger, I will have students peer edit each other and sign off to indicate they did so. Once rough drafts are approved, students create their poster for their presentation. To be sure students understand the theory of their individual they must put together an interactive activity or game that illustrates or demonstrates the theory with the class. For example, students have had us wash white boards in a left to right motion (this is how we read) to demonstrate Maria Montessori. We have been taught (retaught) how to tie our shoes with help first and then independently, once we’ve mastered the concept illustrating Vygotsky’s theory. This one was fun as there are so many creative ways to tie shoes! After students have their activities and posters completed, they orally present and demonstrate each theorist and his/ her theory to the class and take notes on each during the presentation. Assessment in the form of a quiz will follow. Hi Kim, thanks for posting this valuable lesson! I'm looking into using it in my middle school child development class this year along with using the Baby Think It Over dolls. Wow it is awesome blog. All content is really very informative. Most of the visitor like your content. Do you know why most of the visitor like your blog. Most of the visitor like your blog because of your great information. Thank you so much for great data sharing. The activities described in your post are interesting. Hope my students will be pleased to take part in such project. I am in the middle of trying this project for the first time. I needed a fresh way to learn about child development theorists and I love the setup of this lesson! We just did a poster project, so instead of the poster I am having the small groups make Google Slides presentations (each slide is a different letter)-the visual impact won't be quite the same, but I think they are doing a nice job so far. I'm requiring a picture on each slide as well so it will be fun to see what they come up with. Thank you for sharing! I love to see and hear how people adapt the ideas shared on the website!